I've decided that I love seeing photos of my shoes next to my bags for the day. I mean, how adorable is today's duo?! So perfect. It's not a surprise that I have a pretty extensive shoe collection, and I try to get detailed photos of my shoes as I wear them. I've gotten a few requests now for a full on tour of the entire collection, and I really want to do this, except I have no idea where to start, what would be the most informative, creative, yet least time consuming? I've searched around to see what others have done in the past, but nothing has really jumped out at me. So, I guess I will ask my readers - how would you like to see them? How they're stored? Individual photos or arranged in collections by either type and/or designer? Video or still shots? If you have any ideas, I would definitely love to hear them! Ultimately it will be a big project no matter how I plan to attack it, but one of these days, it shall be done!! Loving it! A crisp button up with a pencil skirt is always my fav go-to in the work place. You are rocking it in that color...loves it! Thanks so so much! This is a great work uniform, I do admit! I love this look!! Red looks stunning on you! I would personally like to see your shoes up close and personal so if you don't mind sending them over?! Haha! LOL, love Erica's comment!! HAHAHA. Also agree with Skye that I love your crisp, classic look today with the fun shoes & bag to make it YOU. As far as shoes...I am content to see them as you wear them so I may not have the best input here. But I wonder if you could create a scrolling widget just using your past pictures (like a Shop the Post widget but with your own shoe photos), that readers could scroll through? So, just compile the pics you've already taken of your shoes and photograph yourself wearing any you haven't worn yet to add into the mix? Love this look! 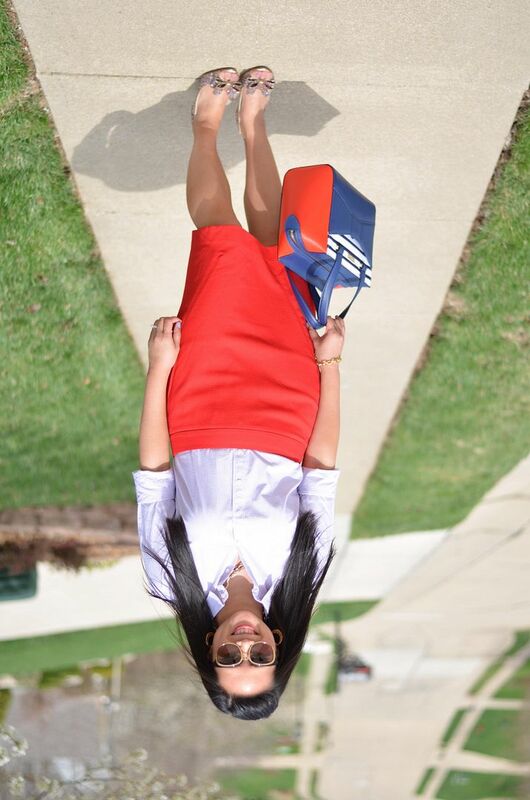 The red pencil skirt looks amazing on you! Visiting from "What I Wore to Work" linkup. Thank you so much! I had another red pencil skirt that I just sold - this one is a great classic fit! I love this bag so much!! Thanks so much for popping over! Thanks so much, girl! This duo makes me so happy! Love the color of skirt! Very chic bag and stylish outfit! Thank you! I appreciate that! It's a bit matchy, but I love it! Love the idea of placing your bag with your shoes. Your Kate Spade bag is gorgeous, such a nice bright pop of colour! I'm such a Kate Spade addict, but it's hard not to be when she has pieces like these! 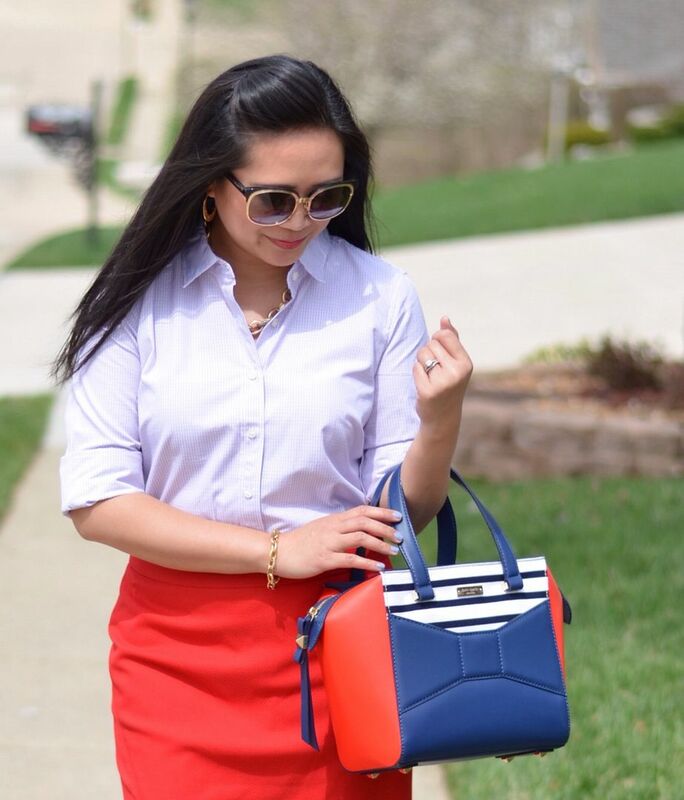 Love your Kate Spade bag and your skirt! Thanks! The skirt was 55% off after all my discounts! So worth it! Thanks for the feedback! I'll come up with a plan here soon enough! I like the bow theme to both your bag and shoes! Boy, I'm not really sure where you'd start with a shoe tour...? But I know I'd love to see it...haha! Do you know I *just* realized "Beau" sounds like "bow" hence the shape on the front of the bag?! It hit me the other day and my husband looked at me like I was dumb! Haha! Oops! I just loved the bag, period! 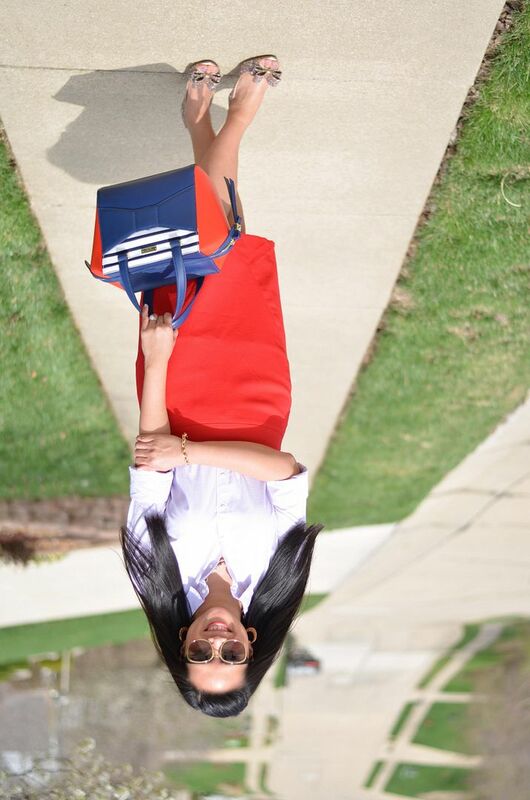 Your bag and shoe duo are super adorable! Love them both!! It would be great to see your shoes arranged by type or collection. Looking forward to seeing more. Thank you for the comment! I have so many ideas floating around, I just need to start something already! You do have a really fabulous shoe collection (also purses too)! I can't wait to see the final photos or video. I love the nautical look...it's my upcoming theme for the next few months. :) I bought a similar skirt to yours from Ban Rep and I love pairing it with blue stripes too. I think I am drawn to anything nautical with stripes! It always peeks my interest and makes me happy! Can't wait to see your upcoming looks! Oh my goodness, I love your Beau! The colors are so perfect, and your pumps are a very pretty pairing. =) Love love love! Thanks so much, Amber! Everything about this outfit makes me happy! Oh yes - before I had my shoe display shelves, I kept all of my shoes in their original boxes with photos on the outside. Maintaining the pictures as I acquired new pairs was not bad, but the initial shock of doing all of them at the same time was a bear! It's been awhile now though and I know I have a TON that need their own photos - outside of me wearing them in my outfits. Hmmm…will keep thinking! Thanks for the feedback! Would LOVE to see your shoe collection - aaaand your bag collection too LOL! Great ideas, thank you SO much!